Location: Negaunee, Michigan at the Heritage Trail. Time: 11:00, please arrive at least 30 minutes early. Cost: $25 for pre-registration, $30 for registering the day of the race. 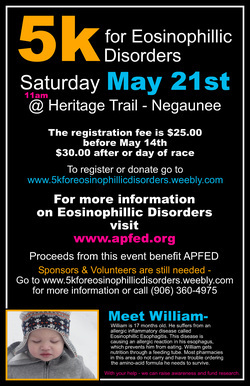 My son, William, is one of those who suffer from an Eosinophilic Disorder. He has Eosinphillic Esophagitis or EoE. It is a daily struggle for him and he is in chronic pain. He has to have many medical procedures done on a regular basis. One of the procedures he needs is an Endoscopy every six weeks. I dream of the day that they find a cure for EoE. For now though, I dream of a less invasive test for the doctors to monitor Williams condition. As of now, that doesn't exist. An endoscopy is the only way. So every six weeks he is put under anestesia, a scope is put down his esophagus and little biopsies are taken of it. My goal with putting on this 5k is to not only raise awareness for a rare disorder, but to raise money to go towards research as well. Maybe the money we raise with this race will be the turning point in coming up with a way for William and other people with Eosinophilic disorders to be monitored in a less invasive fashion. Will you help?